InsideOut is proud to announce the launch of a new hotel website design for the Lodge at Turbat’s Creek, a Kennebunkport Maine Hotel. 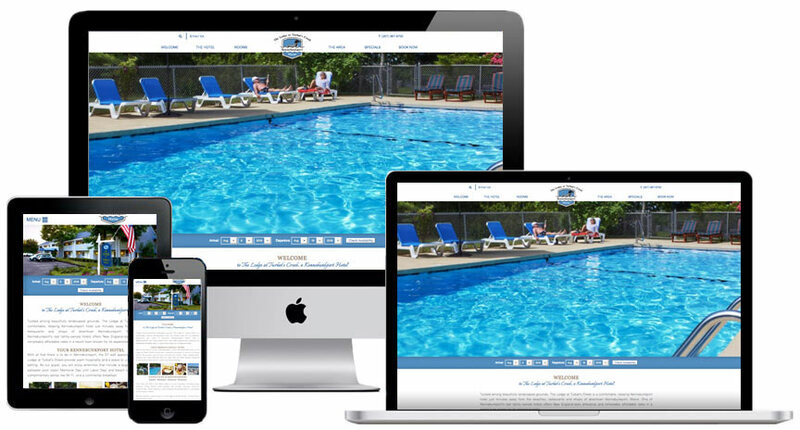 The Lodge at Turbat’s Creek’s owner contacted us because they needed a new hotel website design, and they needed it fast! Their old hosting contract was about to expire and they didn’t want to commit to another year where they were. They were looking for a hotel website design that they could update on their own. A fresh, robust site that could attractively implement their new reservation system. The manager and owner of the hotel did some research and really liked the functionality and look of Captain Jefferd’s Inn, another client of InsideOut’s also located in Kennebunkport. We set to work creating something similar, but different enough so that both properties maintained their own unique feel. The outcome was a clean hotel website design for the Lodge at Turbat’s Creek, delivered on time and on budget. Best of all it captured the essence of Kennebunkport, Maine and their property. After the site launched General Manager Colleen wrote “The site looks awesome. Thank you so much! You and your team have done great work for us.” They added that they have a second property which they’ll be hiring us to create a hotel website design for as well very soon. WordPress allows us to hand the keys of your new website directly to you. The easy to use interface gives you the freedom and flexibility to update your website’s content whenever you want. With InsideOut keeping an eye on your website’s security and functionality, you also get peace of mind. In Need Of a New Hotel Website Design? If you need a new hotel website design or upgrade, InsideOut Solutions offers both custom and concept responsive WordPress designs. Take a look at our Website Design Portfolio, then contact us for a quote and get on the road to a more robust web-presence!